Comfrey salve with oregano is really easy to make, and it’s one of those home remedies that should be in your natural first aid kit. Why is comfrey salve with oregano so useful? 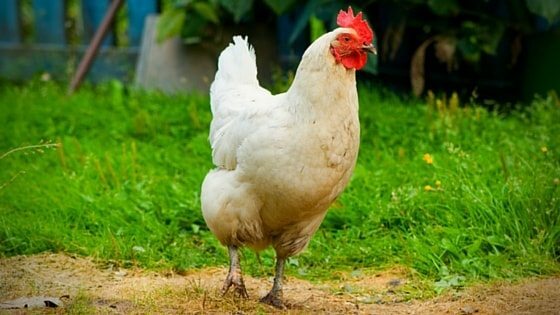 Ok, so how do I make a salve my chickens won’t eat? It’s simple to whip up in just 30 minutes (and I mean literally whip up – once you have your ingredients assembled, it’s just about melting and stirring) but you’ll doubtlessly find a multitude of uses for it. It’s fly season here, which means lots of bites, so we’re battling itchy pigs that are scratching their ears bloody. 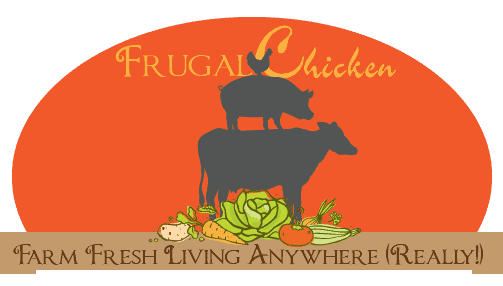 We’ve also got hens that have been overly bothered by roosters, and they could use a little extra TLC. When it comes to comfrey salve, I like making it not just with comfrey plant, but also with oregano leaves. While comfrey has anti-inflammatory properties, the oregano has antibacterial properties that double the healing punch of the salve. The choice is up to you, though. You can make it comfrey alone, or combine it with your favorite herbs or plants to create your own homemade product. If you’ve never heard of comfrey, its scientific name is Symphytum officinale, and it is native to Europe and parts of Asia. It grows 12 inches to five feet tall, and has green leaves and purple flowers. It’s a spring and summer plant, and grows well in full sun. Easy to establish, comfrey is one of those plants that will regenerate—in fact, once you grow it, good luck getting rid of it. A lot of people grow comfrey because it’s sublime for compost piles, and helps yield rich, nutritious soil. 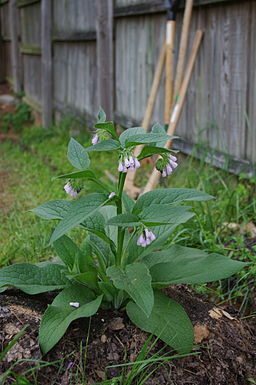 Note, though, if you want to use comfrey for its natural medicinal purposes in a salve, you should harvest the leaves before the plant flowers. You can also use dried comfrey, which you can purchase here. Although comfrey salve has been proven to successfully treat sprains, strains, and inflammation in people, for a backyard chicken owner, comfrey salve is excellent to help your chickens heal from a rash, skin irritation, or inflammation. In studies, comfrey sped up the healing time. Oregano has long been known to have antibacterial properties – in fact, researchers have been studying oregano essential oils as a way to combat antibiotic-resistant bacteria. One benefit is that while it’s natural, comfrey salve with oregano also has no withdrawal times, so if you do need to use it, you can still eat your hen’s eggs. Before we continue, let’s address a myth I see on the internet and in Facebook groups a lot. 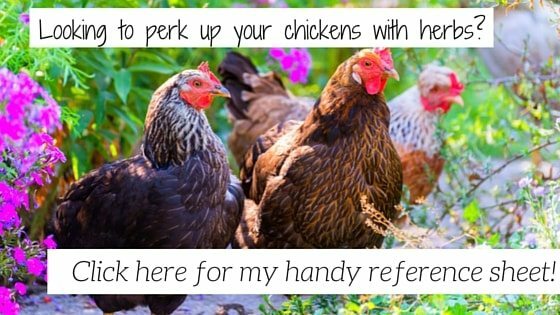 I see advice out there to feed comfrey to your chickens. I don’t agree with this advice. According to the University of Maryland Medical Center, comfrey contains pyrrolizidine alkaloids, which are poisonous chemicals that are known to cause liver damage. So, experts recommend to only use comfrey externally, and to not allow your pets or chickens to ingest it. So, a comfrey salve is okay, but feeding it to your chickens isn’t the best idea. Without a doubt, if you put something in front of them, chickens will try to eat it. So it’s important to create a comfrey salve that can be blended into the skin. This is easily achieved using something like coconut oil, which has a lower melting point than other fats (more on this in a minute). Comfrey oregano salve made expressly for my hens and pigs. Comfrey has a lot of skin healing properties while oregano has antibacterial properties. Extremely simple to make. If you can melt stuff, you can make this. It’s best to start with a comfrey oregano infusion (more about this below), but if you don’t have a lot of time, you can fast-track the infusion. I’ve done this before, and it works out fine. For these directions, I’m going to assume you’re fast-tracking the infusion. First, melt the coconut oil over low heat. When melted, combine the comfrey and oregano in your non-reactive pot with the coconut oil. Place the mixture over low heat until the coconut oil has turned dark green. This indicates that the healing oils from the comfrey and oregano have been leeched. Don’t heat the oil until boiling, just warm it. This takes about an hour, but it might take more. Strain out the herbs until the melted coconut oil is free of particulates (if there’s some still in there, it’s okay, just do your best). In a clean non-reactive pot, combine the infused coconut oil with the beeswax, and return to the heat. (The coconut oil melts at 77 degrees, so combining it with the beeswax means it’s a little more stable, and won’t turn into mush in warmer weather). Continue to warm until the mixture until all the beeswax is melted, stirring every so often to make sure it’s completely combined. Transfer to a clean mason jar or container, and allow to cool until completely solidified. Once hardened, you can start using the comfrey salve on your backyard chickens or other livestock. Combine a half cup of comfrey and oregano (fresh or dried) into 1 cup of grapeseed oil (which I love for its natural healing properties) or olive oil, and let steep for 2 weeks or so. After 2 weeks, strain the comfrey and oregano leaves from the oil. While there’s a lot of steps, when you’re actually making the comfrey salve with oregano, it’s not very hard. If you can melt, stir, and pour, you’re pretty much set. University of Maryland Medical Center. “Comfrey.” Accessed June 21, 2016. Do you think you’ll try to make comfrey salve with oregano? Leave a comment below! Comfrey salve with oregano is really easy to make, and it’s one of those home remedies that should be in your natural first aid kit. Here's how to make it at home. It’s really hard to keep chickens out of comfrey! If I don’t fence it AND make it difficult to go over the fence, they will eat it right down to the roots! When I started free ranging my girls, they mowed two 10′ rows of comfrey down to 2 plants that survived only because I covered them with plastic crates! I do love comfrey as medicine but never saw a recipe with oregano…although I’m heading out for seeds to start a patch, so I can try it. yes, but I’m thinking of using olive oil because: 1. I’m a lot more familiar with it (my Sicilian family and heritage) and 2. I’v used it on animals in the past with success. Olive oil is a good choice too!